One of the up and coming dandan joints in Osaka. Comes in a typical format found in the city: nice and cosy 8-10 seaters tuck in a semi-residential neighbourhood with manageable queues and friendly services. Established in 2015 by Nakashi-san (中司直樹), the shop was named after his two sons as he strikes out on his own after his stint as manager of an Izakaya. It is a well announced sesame paste based version of the bowl, said to be made with choice Brazilian sesame and drawing from experiences gained at the Japanese dandan ‘mecca’ Akasaka Shisen Hanten where he worked before. Sansho is sourced from Sichuan, with chilies being a blend of Japanese, Korean and Chinese ones. Adding on top a decent dosage of minced pork and vegis, the bowl is yet not the most robust one would have hoped for, probably due to the relatively mild usage of chills and peppercorns. That said, a full set of condiments are available and guests are welcomed to perform a little DIY if so desired. All in all, the Kansai flavour has always been less on the spicy side, hence an interesting contrast with those in Tokyo that seem to be going all out with their spices these days. Established in 2013, a rare breed being dandan-men originated from Sapporo, the brand somehow managed to bring out quite a different offering resembling more of those from a soup curry joint, another renowned spicy option from this Hokkaido city. Said to be the outcome of a rather extensive trip by founder Deno-san (出野光浩) to Chengdu, the home of dandan, Szechuan peppercorns and chilies are sourced directly since then from the countryside there. Adding Japanese sansho back home, he created his homemade chili oil, the soul of the bowl, by boiling the ingredients to 175 degrees. Combining with the best of Hokkaido chicken and Sapporo (Sagamiya) ramen making techniques,175° DENO was thus born. Its Tokyo shop, tucked away at a quiet basement in Ginza, with classy jazz music playing in the background and comfy seatings on offer, could easily be mistaken as a typical Japanese coffee shop if not for the iconic ramen vending machine placed up front at the entrance. It certainly has been attracting the more ‘classy’, and predominantly female, crowd, as a result. The bowl, despite its look, was unfortunately somewhat on the blended side. While one certainly can taste the numbness from the peppercorns, it somehow fell short on the tasty side of things. The paste and minced pork, no doubt of decent quality, was just a bit too sweet for LG’s taste. All in all, merely a pass for yours truly, probably the result of some inconveniently lifted expectations by its hype of late. Pilgrimage to Fukamachi-san’s (深町正男) joint on a Friday evening yet an ultra early seating at 5 pm. As the ultimate old guard of the ‘Yamanoue stream’, which LG is a big fan, not to mention all the hype with its rankings, it was not without expectation as we sipped our first beer at the counter while the red hot sun was still shining brightly outside. True to its origin, the typical Yamanoue ‘no frills’ approach was indeed executed perfectly by the Fukamachis, deeply concentrating on their cooking and let the ingredients do the talking instead. 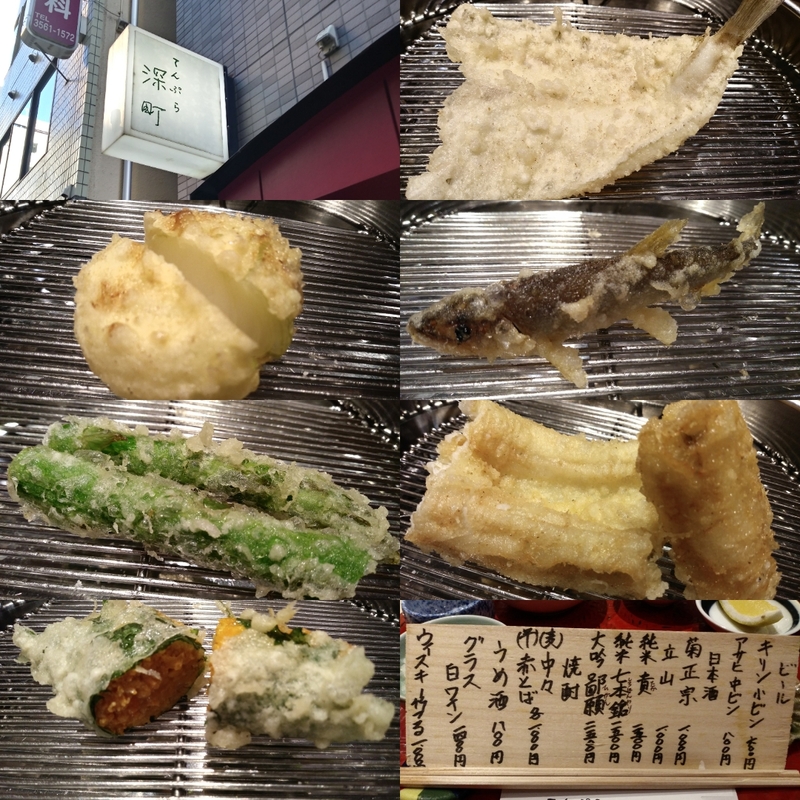 From the classic kisu and magochi to the seasonal young onion and ayu, adding on top the amazing abalone plus other rare goodies, it was an impeccable showing all in all. Will certainly try to squeeze in for a Tendon lunch the next time around, which was said to be the best value in town. Catching on the national Dandan-men rave, it is interesting to see that the home of Tonkotsu ramen doesn’t really feature a pork bone broth dandan, but rather one based on another Hakata favorite, the equally popular Mizutaki, the clear chicken broth hotpot. Had my first go for this interesting hybrid at the famous Mizutaki joint Toriden and opted for their more conveniently located KITTE outlet dedicated to the bowl. Again amazed by how far the local taste has evolved as in going for more numb and spicy versions of dandan and pleasantly surprised by how good a match it was with the usually elegant and subtle chicken broth. Certainly not your traditional bowl but if one ever get tired of tonkotsu one day while in Fukuoka, this may well be the saving grace. As even the legendary Hanamidori is reportedly going into the scene, this is probably the featured grand finale at a Mizutaki place in the future rather than the usual congee. Pilgrimage to this Ginza Yoshoku joint, home of the famous ‘katsu curry’ (pork cutlet with curry) dish. It was said to be created by the suggestion from famous baseball player Chiba-san (千葉茂) of the Giants, who would always come for the dish before a big match, as the name ‘katsu’ also means ‘victory’ in Japanese. This showa-era shop is indeed a legend of its own, started by Okada-san (岡田進之助) back in 1947, a self-taught French cook yet having much influence from the Yoshoku legends of Japan, including Akiyama-san (秋山徳蔵), the Emperor’s Chef, aiming to provide affordable yet quality western dishes to the public after the war. His son, (岡田義人), took over subsequently after horning his skills at yet another major Yoshoku establishment of Japan, the Imperial Hotel, and had since then took the shop to the legendary status it enjoys today. Couldn’t help but to squeeze in the time for a quick stop before hitting the airport on what was a cold and wet day to try out this much hyped dish, and yet ended up being the best ‘Japanese style curry’ that yours truly have ever tried. Said to be building on the concept of Imperial Hotel’s ‘Calcutta style curry’, the wide range of vegis and spices being used were all so well blended and melted into the amazing paste which, for the first time, finally brought out the hint of ‘Asian-ness’ which LG has always been looking for in Japanese curry yet never found till now. While the truth would probably never be told, it was some kind of a pickled yet smokey taste that brought along such an unforgettable kick to the dish. Officially declared the best Japanese curry as per LG! Visiting the reigning Niboshi king for a weekday lunch at a slightly off center location and luckily managed to squeeze in within an hour before they sold out. Yet another case of self-made expert, said to have visited more than 500 ramen joints before finalising his own style, Mimura-san (三村悠介) settled with Niboshi (dried baby sardines) finally back in 2011, widely believed to be the next big thing then after the much hyped noko gyokai. Interestingly after these years only a handful made it to the hall of fame alongside Ibuki really, with the exceptions being the Osaka-based Sanku, said to be hugely influenced by Mimura-san anyway, the fellow Tokyoite Ito, and the much hyped Nagi in Shinjuku. Just making sure that you have been warned, the shop did put up a big sign out front claiming that it is not a style for everyone, due to its bitter and fishy-ness, and people should think twice if they are not certain. Even if Niboshi is your cup of tea, the dosage used here is close to a ‘crazy’ level as claimed by some. If the PR-centric Nagi can make a big fuss out of their 60g a bowl of Niboshi, think Ibuki’s 130-200g dosage per bowl and you get the picture. For Niboshi lovers however, the bowl turned out to be the most seafood flavoured ramen one can find out there, and the accompanying chopped onion and braised pork are perfect icing on the cake, on top of the noodles from 三河屋製麺 that needs no further introduction. Not the most convenient location but if one is on the Mita-line heading towards Kanda for some curry, it is a easy detour. Go there early for both sessions to avoid disappointment as they really do serve only a few decades per day. One on the wish list for joints to be brought into town no doubt!